I’m happy to say that OnScreen DNA Model for Mac, barring an unexpected delay by Apple’s gatekeepers (it’s been waiting for review for a week), will soon be available on the Mac App Store. Check out nondummies.com for news. I’ll intersperse a few screen shots from the app below as a preview of things to come. While I’ve read of some independent Mac developers worrying about what the advent of the Mac App Store might mean for their sales and profits, I am almost certain it will be beneficial for the OnScreen Science, Inc. apps. The Mac App Store (limited to Macs running at least OS 10.6.6) provides a virtual shopping center for Mac users wanting to purchase software to run on their Macs or just to browse through the selections—conveniently categorized—for future reference, much as the iTunes App Store has been doing for iPhone and iPad users for quite some time. Of course Apple keeps 30% of each sale for itself, but in addition to the great drawing power of an Apple-run app store, it’s providing a lot more for that. Start with buyer confidence. If an app is for sale on an Apple-run app store, Apple has at least verified that it is not obviously buggy nor, in the reviewer’s judgment, totally worthless. Furthermore, buying the app is very simple, as the buyer’s credit card info is already in Apple’s (presumably secure) possession, and installation of the app on the user’s computer is automatic and immediate. And the procedure will already be familiar to many users from earlier experience with iTunes and its App Store. Each app approved for sale on the app store is given a chance to present its best face through the developer’s own description and up to five screen shots (chosen by the developer), showing the app’s features. I should add that the feature page for the app can also serve to give users clues as to which apps are likely “crap apps.” Personally, I’m always a little suspicious of apps with only one or two screen shots. Apps not only appear (with name and icon) in the array of apps displayed by category but can be found via keyword search. This search feature is crucial for niche apps such as those sold by OnScreen Science, Inc. because after a few days an app that’s not a big seller tends to become practically invisible to all but the most dedicated browsers, as the app moves farther down the list ordered by release date. The big sellers remain visible by virtue of their sales in a separate list devoted to the most popular apps. Now, for games, the importance of being on the list of popular apps is obvious, and this is what has driven the “race to the bottom” for app prices, as the presence of high quality games selling for 99¢ can make an app, even a “serious” one in a very different category, seem outrageously expensive at $4.99 in some minds. I think there’s also something about the ratio of the price of the app to that of the device it runs on (and screen size) that makes app prices so low for apps on the iTunes App Store. But in the final analysis it’s really the ability of some developers to make a lot of money selling apps at a low price, thanks to the enormous number of potential customers, all funneled to a single buying point, that keeps prices low. That and the “free” apps, which I may write something about at a later time. Let me say a little about the “desktop” OnScreen DNA apps from which the OnScreen DNA Model apps spring. 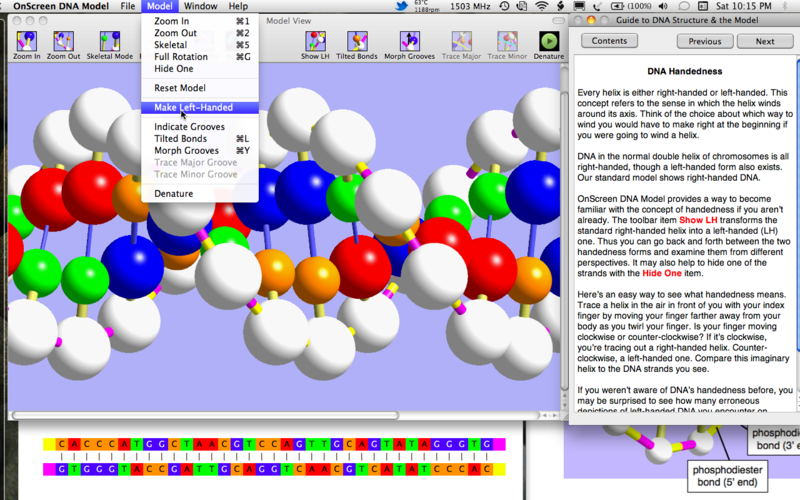 OnScreen DNA, sold in three flavors—Lite, Standard, and Pro—has been available for Mac and Windows computers for several years. All these apps, especially aimed at biology teachers for use with students or for classroom demonstrations, are presented in a tutorial format that guides users through activities, complete with animations, designed to teach the structure and function of DNA. Anyone that already has OnScreen DNA Lite will not be getting anything essentially new by buying OnScreen DNA Model on the Mac App Store. Rotating the model with the mouse is easier in the new app, as it is done with mouse drags requiring no key to be depressed. Some might prefer the new presentation of DNA facts to the old tutorial method. But as far as the basic model and the two simulations go, nothing much has changed. The Lite version deals mainly with the structure of DNA, though it includes simulations of denaturation and renaturation. OnScreen DNA (without the “Lite” qualifier) adds simulations of gene transcription and DNA replication with a good deal of detail about the enzymes involved and an accurate depiction of the basic steps (hydrogen bond breaking, strand unwinding, nucleotide chain forming, etc. ), including proper direction of chain-building, primer RNA and Okazaki fragment construction, and even the role of telomerase in solving the “end problem” of DNA replication.The Pro version adds simulations in which the user, not limited to observing processes unfold, tests his or her knowledge by actively selecting the proper enzymes at the proper time and choosing the next nucleoside to add to a growing polymer chain. I should add that these apps, being designed mainly for teachers, include interactive tests, the results of which can be stored on the computer (under password protection if desired). More details about these apps, which are still unique and still for sale, can be found at onscreen-dna.com. The aforementioned web site has been (and is still at the time I write) the only place to buy these apps. Thus sales have largely been limited to the hardy Googler that seeks DNA teaching software, or is at least searching for detailed information about DNA. No one with just a vague interest in science and biology is likely to stumble upon the web site. The price for advertising in even a relatively small circulation magazine for science teachers is really too high to justify from the sales it would likely produce, based on past experience. Though a ninety-day, no-questions-asked, satisfaction guaranteed policy for complete refund is in effect for our apps, I’m sure many people are hesitant to buy from an unknown online source. Thus the Apple seal of approval could be extremely valuable. After the iPad was announced, I came to see it as a opportunity to bring some of the OnScreen DNA software to a larger audience (using the existing code for displaying the three-dimensional DNA images on the iPad). I knew from experience with “DNA Day” sales for which I announced large discounts for a short period via a few Mac news sites that there were people who were not teachers that might be interested in a way to learn more about DNA for a price that wasn’t too high. By far the easiest path seemed to be to start with a port of OnScreen DNA Lite to the iPad. Partly from screen space considerations I decided to scrap the tutorial format. I refer the interested reader to an earlier blog post The Thinking Behind the OnScreen DNA Lite™ iPad App for more about the iPad app. In some ways I felt the iPad app to be better than the Mac/Win versions just because of the direct response to the fingers, unmediated by a mouse. But, due to limitations of the somewhat stripped down version of Open GL (graphics programming API) available on the iPad, some features were lost, such as the ability to ctrl-click on any component of the DNA model to see it labeled. Of course ctrl-click has no meaning for the iPad anyway. In place of the labeling feature I added a popover image with a key showing how all the different parts were represented in the model. The iPad app was launched with the old name OnScreen DNA Lite, which didn’t make all that much sense in the iPad context. This was rectified by the new and current name OnScreen DNA Model, which is more descriptive and avoids the implication that there is a more advanced version of the app available for the iPad. At the same time as the name change, the app gained a significant enhancement with an on-screen (popover on iPad) guide to facts about DNA’s geometry, molecular components, and chemical bonds and how they are displayed in the model. The blog post OnScreen DNA Model for iPad and iPhone: New Name, More DNA Background illustrates the changes. Oh yes, as the title of that post indicates, a version for the iPhone and iPod Touch is also available. When the Mac App Store was announced, I had no doubt that I would want to bring the OnScreen Science, Inc. science education apps (OnScreen DNA and OnScreen Particle Physics) to it. 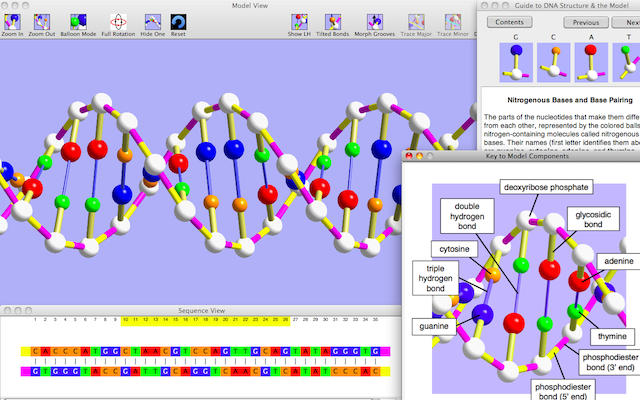 It took a bit of thought to decide what to do first, but based on the relative success on OnScreen DNA Model on the iPad (sales have continued to rise, contrary to the usual fate of apps on the iTunes App Store), I decided to get a version of OnScreen DNA Model ready for the Mac App Store. 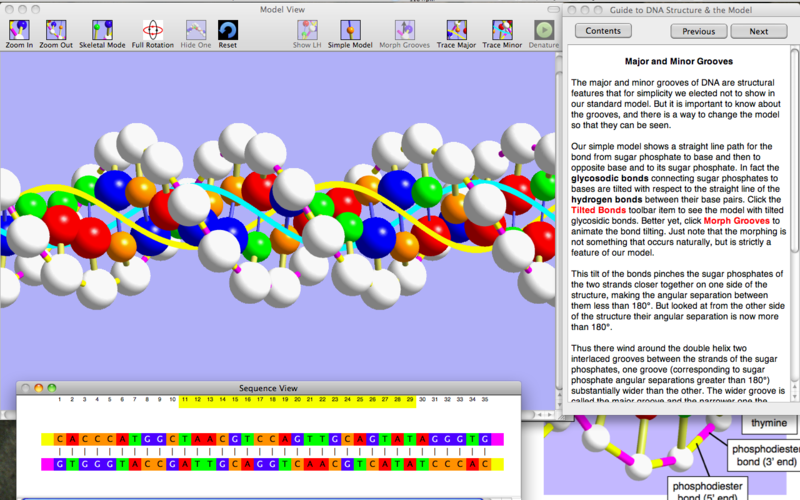 This was a decision to make the Mac version very similar to the iPad version, rather than a small modification of the existing OnScreen DNA Lite. 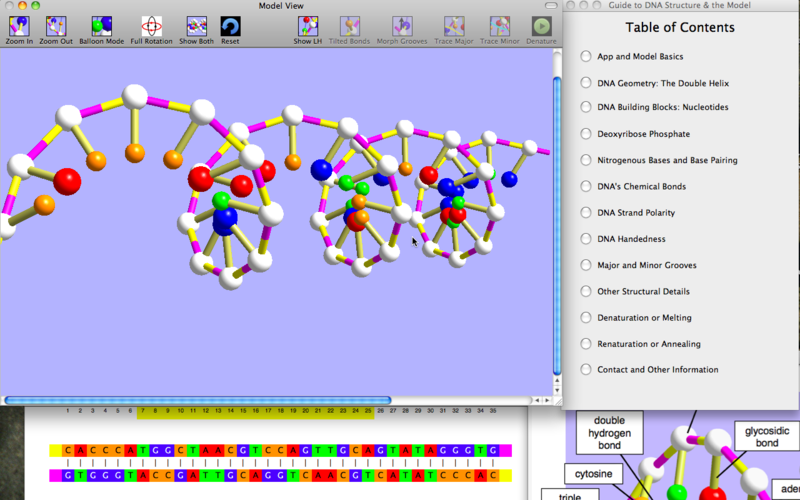 Thus the tutorial and the division into activities are not found in the Mac App Store version of OnScreen DNA Model. I think this is a net improvement due to the greater freedom it gives the user, even at the risk of some important points possibly being missed and without the potential benefit of a guided discovery that aims to get the user thinking. To a certain extent, how successful the new app is on the Mac App Store will determine how quickly I move to bring the simulations of OnScreen DNA to the store. There are a number of decisions, really, about what to attempt in the way of simulated DNA processes for the iPad version and whether to work on the iPad or the Mac version first. It may make more sense to get OnScreen Particle Physics (onscreen-sci.com), our classic particle detection chamber simulation, onto either or both App Stores first. Time will tell whether I’m being too optimistic, but I’m really encouraged by the opportunity the Mac App Store is giving me and other independent developers to get our apps before a lot of new eyes and minds. You are currently browsing the archives for the Mac Development category.